Reports on sightings of UFOs over County Roscommon in 1997 set in train a passionate interest in the paranormal and inspired Dara deFaoite to write this probing and scholarly book. Paranormal Ireland goes beyond recounting stories of ghosts, haunting, strange creatures in woods and poltergeists to reveal a rare insight into what science has failed to explain. 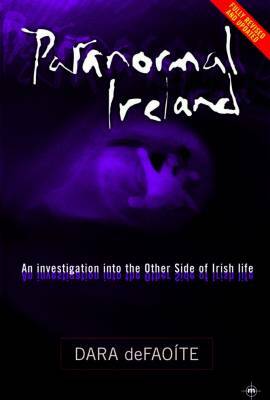 Superbly readable, Paranormal Ireland recreates from interviews and notes the appearance of big cats in Tipperary, sightings of UFOs over Roscommon, the harrowing experiences of a family in Galway at the hands of a poltergeist, amongst other mysterious tales. DeFaoite has produced a book with all the feeling and depth of fiction, but more shocking because it’s true. This delightfully eery book also includes a Travel Guide to the Paranormal in Ireland.